It seems I’ve been travelling forever. First almost a month in Italy (yes, it was wonderful), then a week in Toronto for the Garden Bloggers’ Fling (exhausting and wonderful), then a week with my sister for some together time on Long Island and in New York City (hot, humid and wonderful). 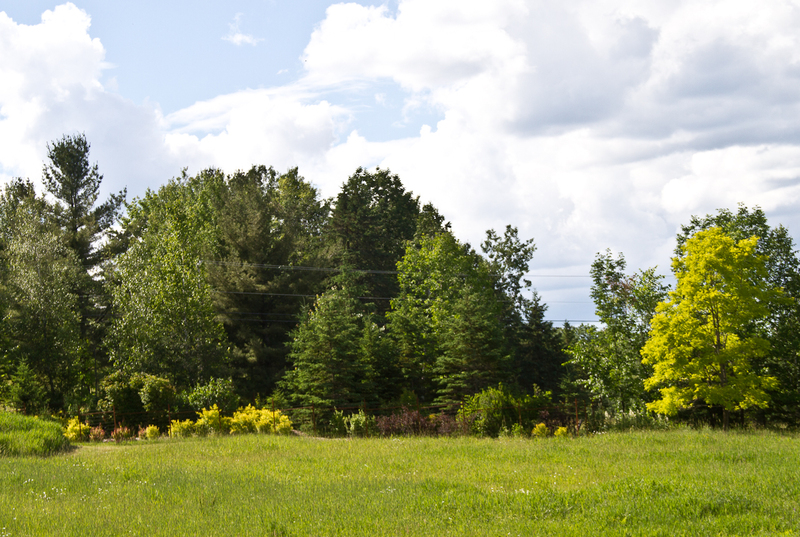 Bur finally I’m home and able to enjoy the beautiful early summer weather at Glen Villa, my garden near the village of North Hatley, Quebec, about 90 minutes east of Montreal. 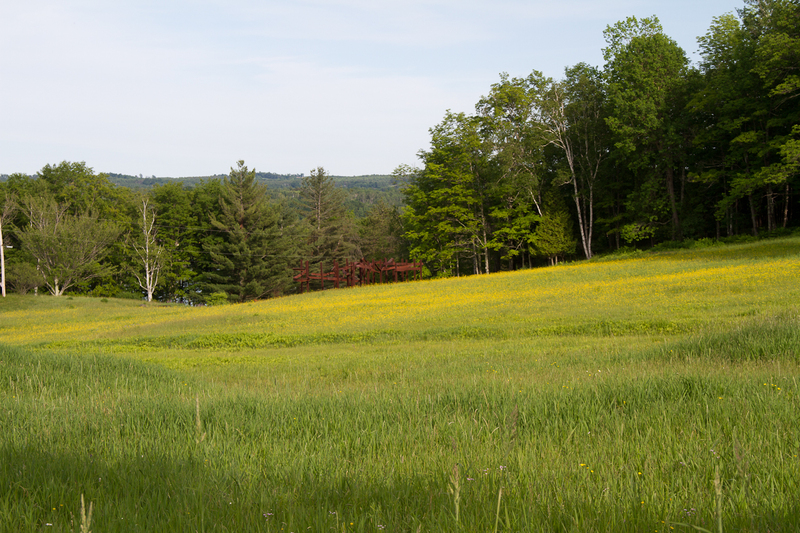 Buttercups turn the upper field at Glen Villa to yellow gold. Barely visible in the background is the top of a large sculpture called Bridge Ascending. 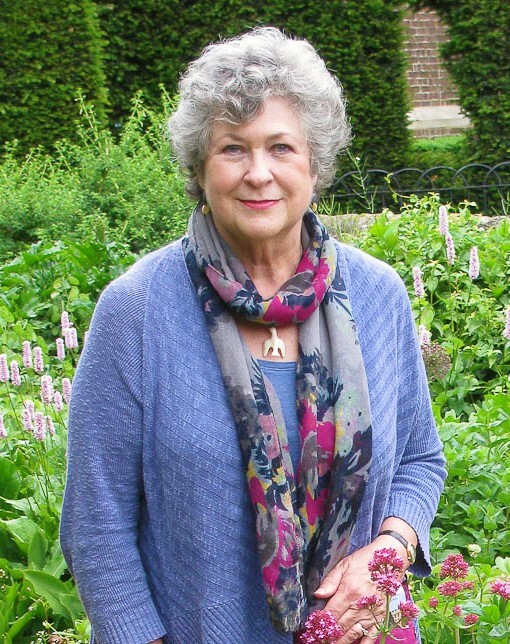 While I am enjoying the garden, I’m also evaluating it, both in light of what I’ve seen in other gardens and in terms of my own intentions and desires. Doing this takes concentrated effort — time to remember what I set out to accomplish and then time to examine how well I’ve managed it. Walking around the garden with my camera, taking photographs and notes, is one way to assess progress. A harder approach is to write up what I see, to dig out the old photos and to compare memory with reality through a suspicious eye and a truthful pen. Over the next few weeks, I plan to review different areas of the garden, assessing what I’ve done and what I still need to do. 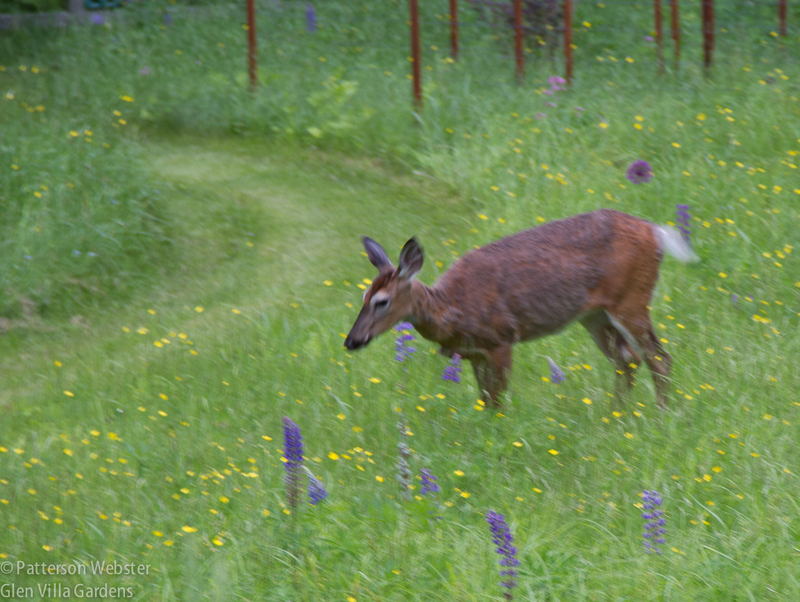 Today I am starting with a long-term project that combines plants, hardscaping and the exasperating problem of deer that won’t go away. 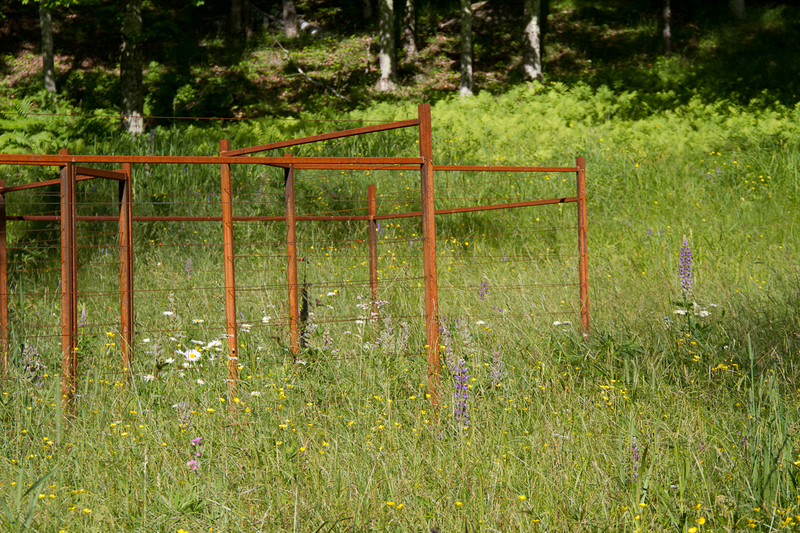 Three years ago I designed fencing to keep deer away from shrub borders in the Asian Meadow and the Upper Field. I first planted these borders in 2008 but nothing grew, thanks to constant nibbling. 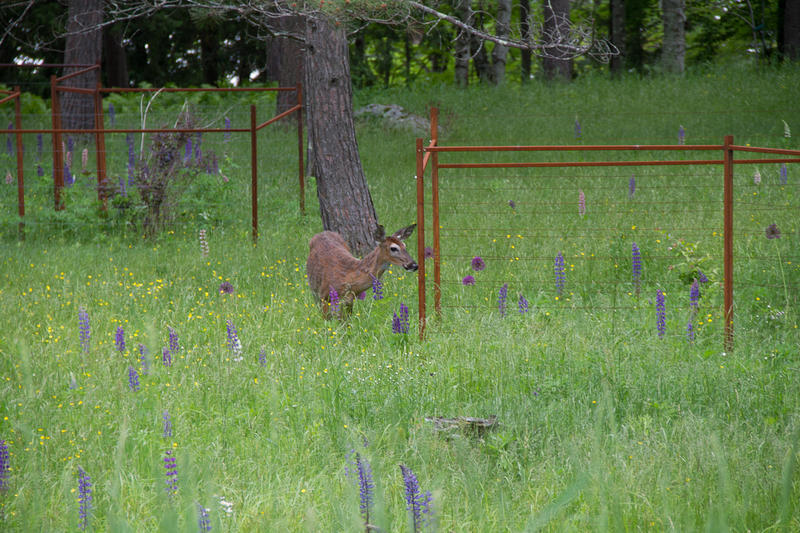 A hungry deer investigates what is behind the fence in the Asian Meadow. I wanted shrubs in the Upper Field both for the colour they would add and to block the view. As part of an old farm, the field was wide open to the road and I wanted to make the space feel more private. Large sprawling shrubs seemed an obvious answer. 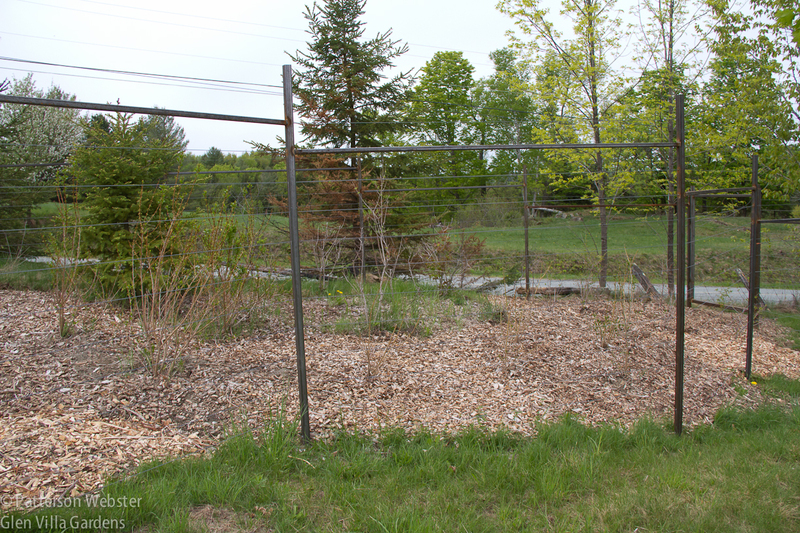 Shrubs were not very effective in blocking the view; before the fencing went in, they never had a chance to grow. Several years of disappointment convinced me that I needed fences. I didn’t want anything elaborate or showy yet none of the standard hardware store options fit the bill. So I designed something that I hoped would work — a combination of steel posts and ordinary cable. The shape of the fence was important. I didn’t want a square box or a curving edge, rather I wanted something with straight lines that felt contemporary. Since the back side of the border faced the road, it had to be straight. To get away from a boxy rectangle, I made the front edge zig and zag. This side view of the fence shows how it zigs and zags down the hill. I didn’t want the fence to slope down the hill so the top bars step down to remain parallel with the ground. I enlarged the bed significantly — my first effort was much too small for the space. The fence went up and I began to plant intensively. By the end of June last year, the borders in the upper field were beginning to look the way I envisioned them. 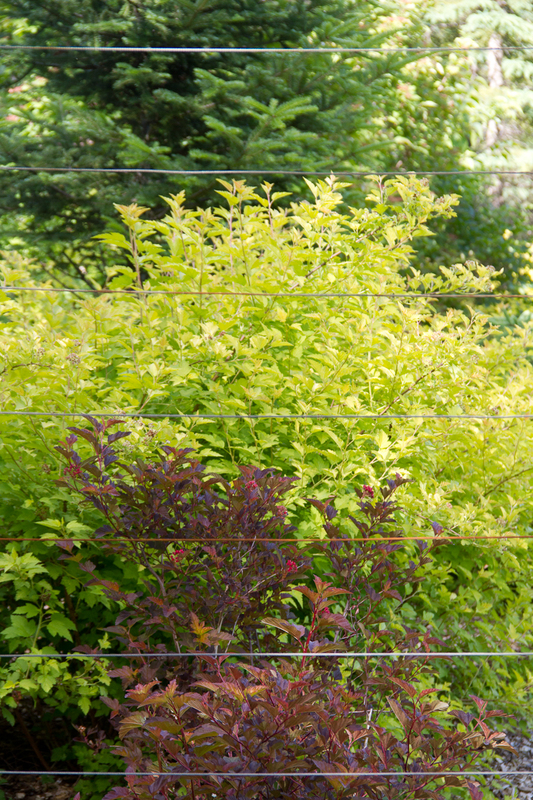 A dark-toned barberry and Physocarpus ‘Gold Nugget’ provide a strong colour contrast. This year they are looking even better. Finally the shrubs are growing and blooming as they should. This long distance photo gives some idea of the size of the area I’m working on. From a distance the fence disappears. A lot goes on in the Upper Field. 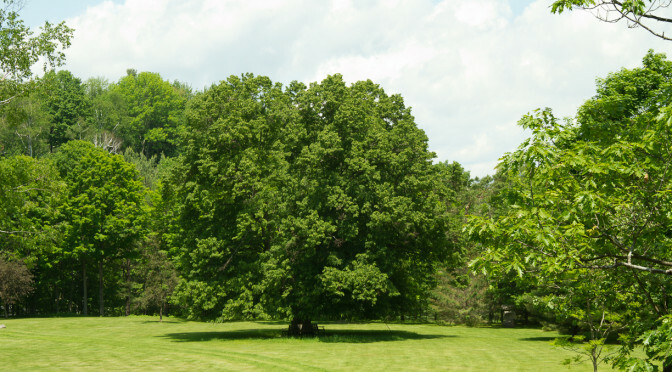 There’s a collection of nine ‘grandchildren’ maples, with two more to be planted this year. There’s a large pond with ornamental grasses and my art installation that honours the original inhabitants of the land, the Abenaki Indians. In planting the shrub border, I wanted to acknowledge the agricultural history of the site but I didn’t want to plant corn or some other crop that might once have grow there. 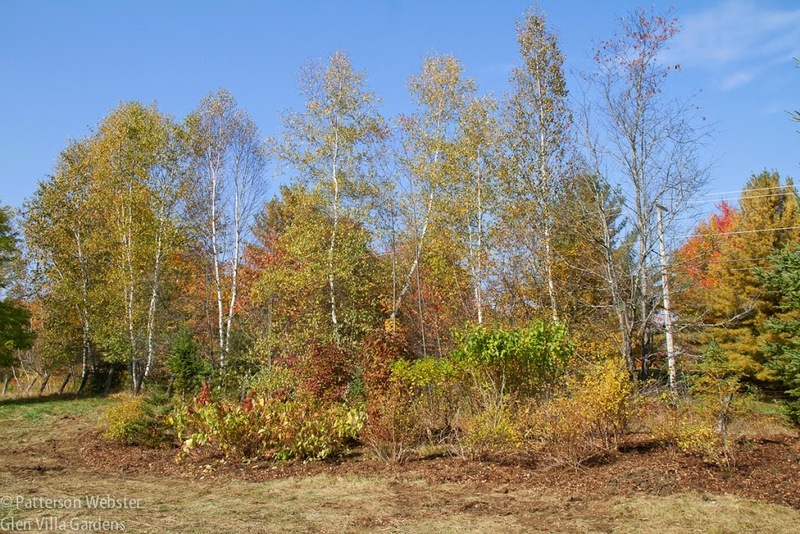 Instead, to retain its rural feel, I planted varieties of native shrubs and other plants that are typically found in and around farmhouses in this area — lilac, viburnums, mock orange and different types of ninebark. 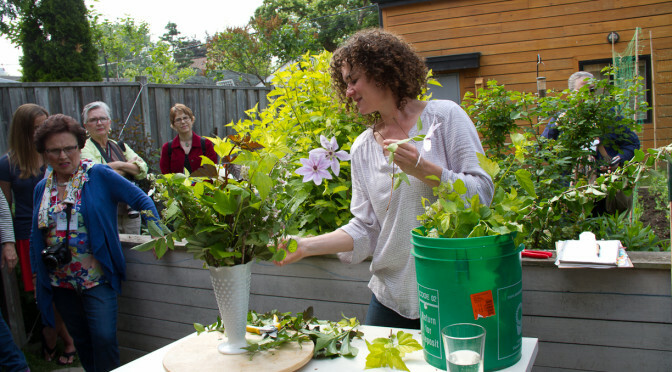 I wanted colour even when shrubs aren’t blooming — and I wanted it to be visible from far across the field — so I chose shrubs with punchy foliage contrasts. 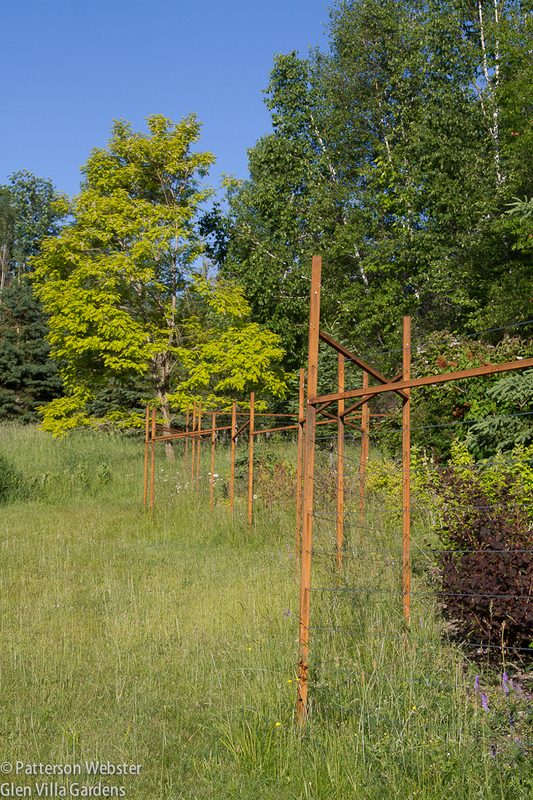 Three colours of foliage appear at one end of the fenced border: the dark green of spruce, the chartreuse of Gold Nugget’ ninebark and the coppery-orange of Coppertina ninebark. 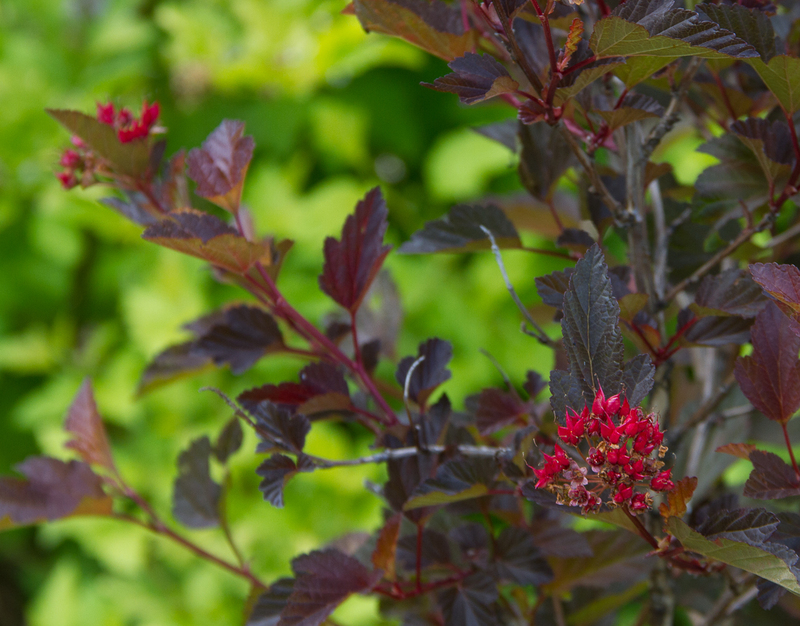 I’m particularly pleased with the varieties of ninebark (Physocarpus opulifolious) that I selected. After I planted it last year, I thought I’d made a mistake choosing ‘Coppertina’ but this year’s blossom tells me otherwise. Yet I’m puzzled. What I read on line says that the blossom on this variety is white; the blossom on my shrub is anything but. 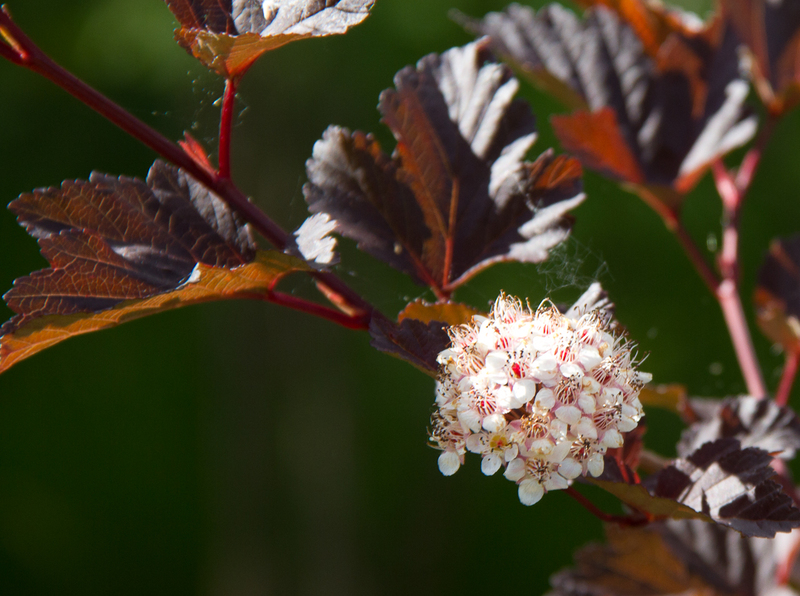 Physocarpus opulifolia ‘Coppertina’ has a stunning red bloom as well as a more subtle tonal variation in the centre of new growth. So is it ‘Coppertina’ or some other mis-labeled variety? At this stage the blossom looks more interesting than the creamy pink of another ninebark variety, Physocarpus opulifolious ‘Diablo,’ but time will tell which variety performs better under my conditions. 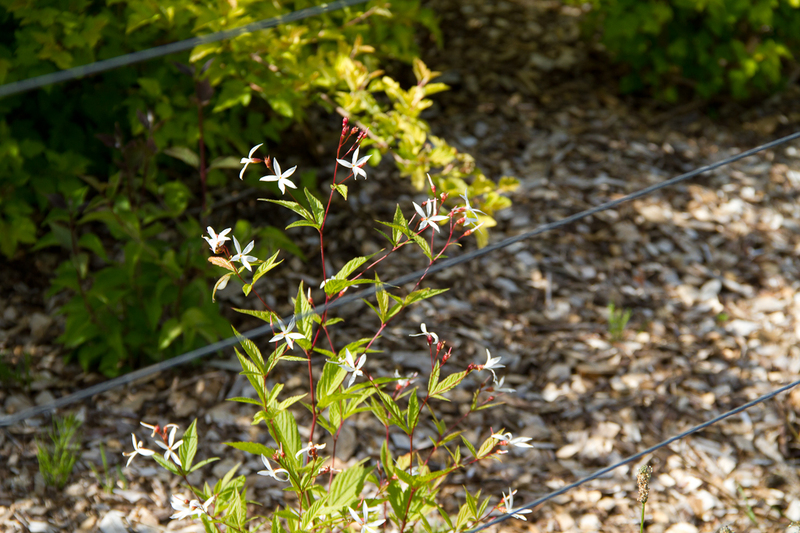 Physocarpus opulifolius ‘Diablo’ has deep wine foliage with pale pink blossoms. Gillenia trifoliata is still tiny — I planted it last summer — but it will grow to form a good-sized mass. 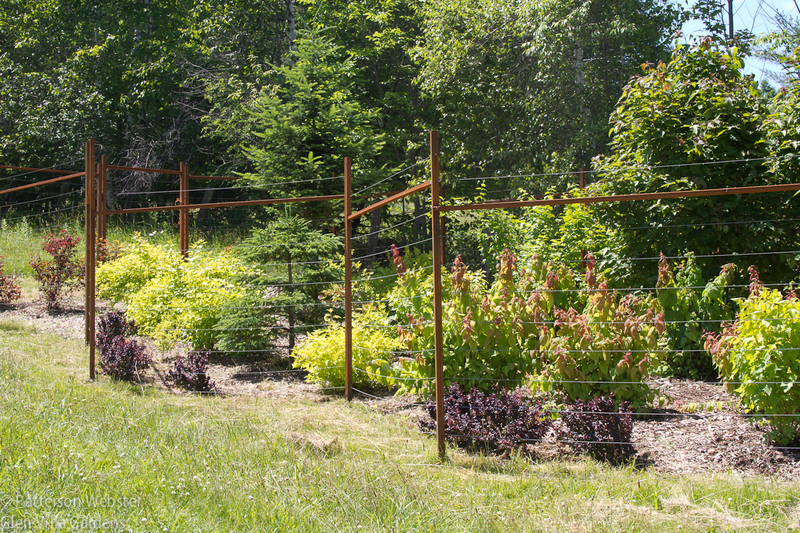 Between the two fenced shrub borders in the Upper Field are groups of evergreens and large deer-resistant plants that add colour and interest throughout the growing season. Giant fleeceflower (Persicaria polymorpha) performs extremely well here. 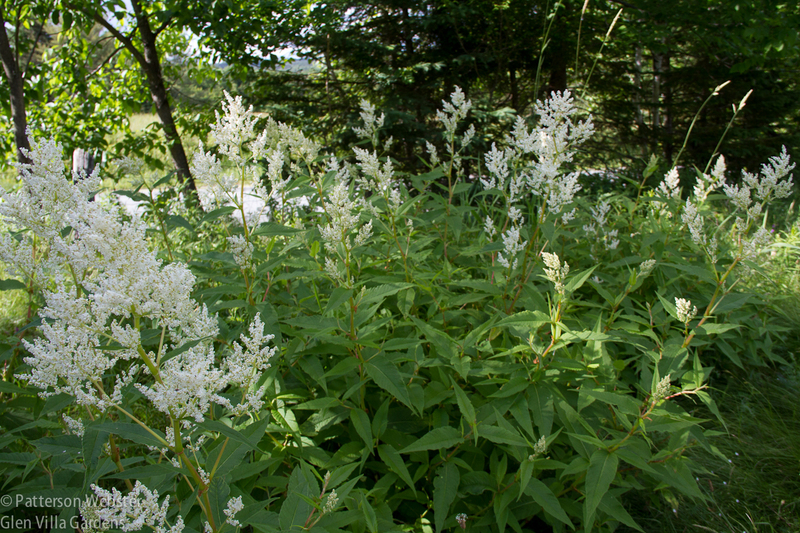 It is a big shrub but the Upper Field is large enough to handle several large groups of it. The borders in the Upper Field now provide the colour I was looking for and screen the field from the road. They need fine tuning but generally I’m pleased with the way they are developing. Before the shrubs began to grow, the road was far too visible. It used to be dirt. Once it was paved, traffic between the villages of North Hatley and Sainte-Catherine-de-Hatley (or Katevale as it used to be known) increased dramatically. 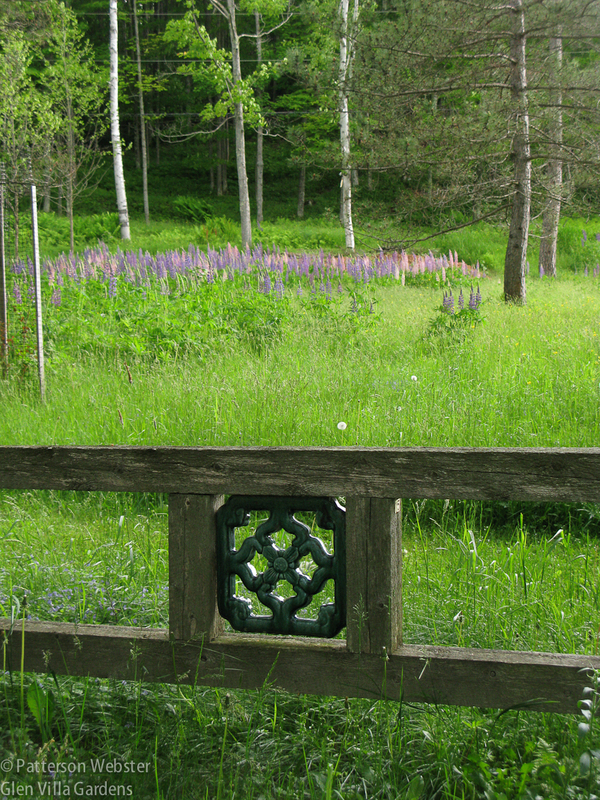 I am not pleased at all with the fenced areas in the Asian meadow on the hill above the house. When I first began work on this area some ten or twelve years ago, it was flat and uninteresting. Still, it couldn’t be ignored because we passed it daily, every time we drove in or out of the house. There was some weedy grass with a few scattered lupins, some large pine trees full of dead wood, and a stream of sorts with no defined bank. I started work in the area by pruning the trees. Once the dead wood was gone, not much was left. In fact I had removed so much wood that some of the pines resembled giant bonsai. Since my husband and I lived in China many years ago, I decided that this would become the Asian Meadow. I sculpted the bank of the stream, creating little waterfalls, and added a Chinese stone lantern beside the zig-zag plank bridge as well as Japanese and yellow flag iris. 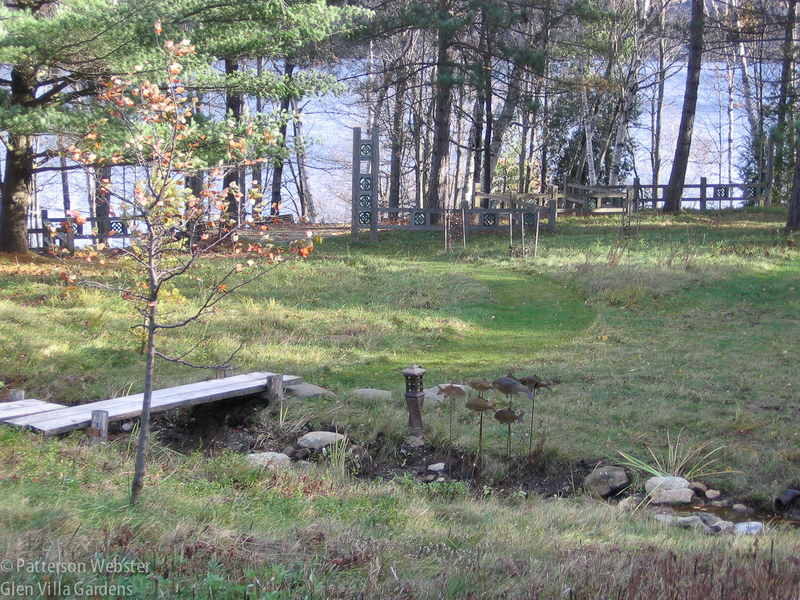 This view of the Asian meadow is from October 2007. You can see the plank bridge, the stone lantern and some fish swimming in mid air above the stream. (I’ll tell you the story of the fish another time.) Near the fence in the background is temporary fencing put up to protect the first shrubs I planted. It didn’t work. My husband wanted to add a picnic area, so we built a zig-zagging fence inset with Chinese tiles to separate the picnic spot from the meadow as a whole. 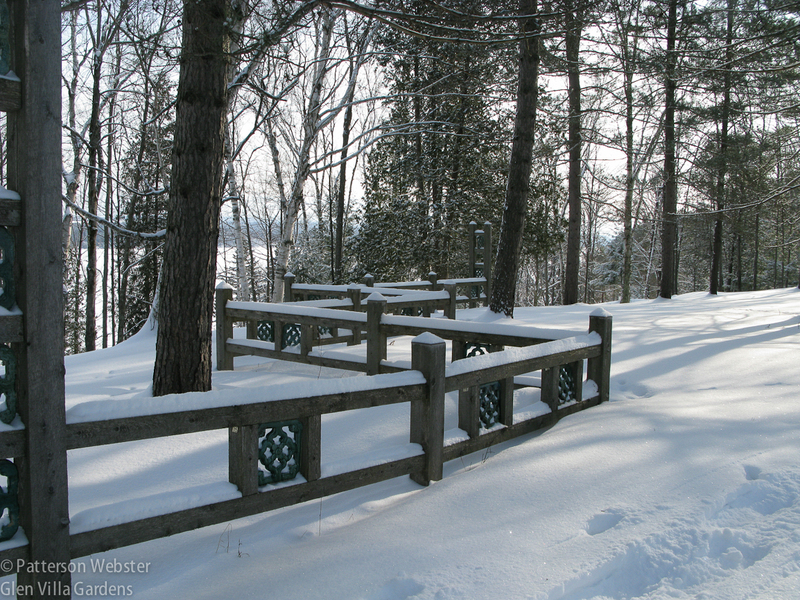 This winter view shows the shape of the fence inset with Chinese tiles. It zig-zags along the brow of the hill through masses of ferns that grow there naturally. To screen the picnic area from the drive, I added trees and shrubs — and despite choosing plants that were said to be deer resistant, the deer decided otherwise. After trying temporary solutions for several years, I finally concluded that fencing was the only answer. And based on the work done the previous autumn in the Upper Field, choosing materials for the fence was easy. Using the same steel posts and cables, I focused on the shape of the fences, making that the dominant feature rather than something incidental. The Chinese tiles in the nearby fence suggested squares set on an angle; the squares morphed into diamond-shaped cages. The tiles follow traditional Chinese designs. Some have good luck symbols in the centre, this one does not. On the left of the photo is a stake, part of a temporary fence around a shrub. To make maintenance as easy as possible, I connected several cages to form a single unit, adding a door for access. 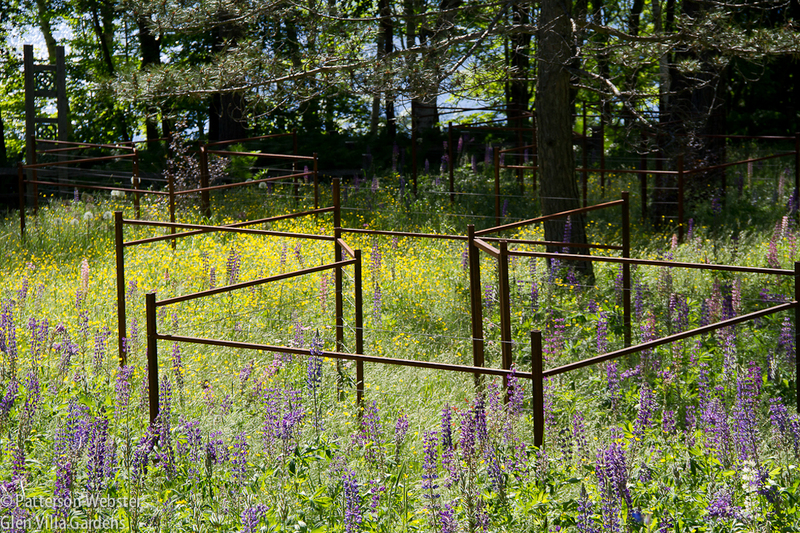 This photo from last summer shows the shape of the cages, now set amidst a meadow full of wildflowers.There are three sets of cages, each with a single section that is a door. The door for this cage is on the short section on the right. Inside the cages I planted more Physocarpus ‘Diablo’ plus other shrubs that could tolerate deeper shade. 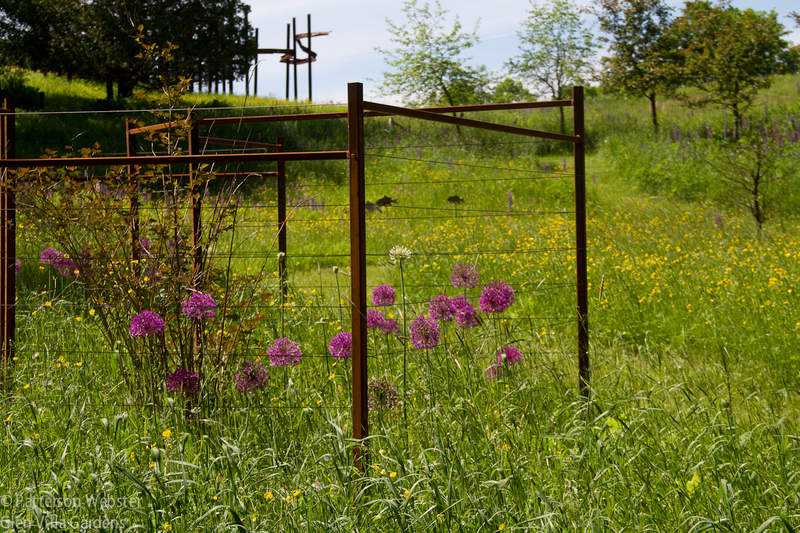 I added tulips for spring bloom and planted allium inside and outside the cages, thinking their purple blooms would add spots of colour early in the season as well as a touch of humour — the idea of caging a plant that deer don’t eat made me chuckle. Goodness knows why. Last summer the shrubs were still small and looked rather pathetic, but the alliums bloomed well. The sculpture in the background is called Bridge Ascending. You can read more about it on my website, Site and Insight. This year there is nothing. No shrubs worth showing, no alliums at all. Just empty cages protecting nothing. What to do now? Plant again? Mow the grass inside and leave the grass long everywhere else? There are deer of course. Always. Everywhere. The deer are no longer afraid of humans. In fact, they stare at us as if we were the intruders. Perhaps we are. Have I accomplished what I set out to do? In the Upper Field, I think I have. I need to go through a full year before I can assess whether the shrubs I chose will give the season-long colour I want. They certainly are screening the field from the road, already large enough to block the view entirely. The evergreens provide a dark background that makes the lighter foliage shine. I suspect that some shrubs will become too large and require too much pruning, but that is a problem I will deal with as time goes on. The choice of barberry bothers me. It doesn’t conform to my initial requirements of indigenous plants or ones that were commonly grown around old farmhouses. Yet I haven’t found other shrubs that I can plant close to the edge of the fence that the deer won’t eat. Have I looked hard enough or have I simply purchased what was readily available? The results in the Asian Meadow are disappointing at best. I’m not sure about the shape of the fences. Do they ‘read’ well and does the shape complement the un-mown meadow grasses? Are they too angular? Too complicated? And am I prepared to replace them if they are? I welcome your views on these and any other points that occur to you. Still to come are evaluations of the China Terrace, the Yin/Yang and the Big Lawn, the Lower Garden, the Egg and the Aqueduct.